Israel first state to sign agreement on reciprocal industrial research and development ties with Japan; heralds stronger bilateral ties. Japan's Minister of Economy, Trade and Industry arrived in Israel on Sunday to sign an Industrial R&D (Research and Development) Collaboration Agreement with Israel, making the Jewish state the first country Japan has signed such an agreement with. Toshimitsu Motegi, the Japanese minister, met with Economics Minister Naftali Bennett while accompanied by a delegation of Japanese industrialists, as well senior representatives of Japan's Ministry of Economics, Trade and Industry, the body responsible for Japanese industry, industrial R&D and cyber technology. The new landmark agreement paves the way for reciprocal support in joint industrial R&D projects between Israeli and Japanese companies and organizations. During the visit, the delegation is also to join a seminar on opportunities for cooperation organized by both countries. "This is a breakthrough achievement. The agreement creates an excellent platform for joint initiatives, innovation and for Israeli companies to enter the Japanese market," said Bennett in praise of the new agreement with Japan, which boasts the world's third largest GDP and highly advanced technology. Israeli exports to Japan, led by machinery and electronic equipment, decreased by roughly 20% from 2012 to 2013 as the Japanese yen went through a severe devaluation. Likewise Japanese imports to Israel fell by 30.8% in the same period. It is hoped that the new agreement will strengthen the status of bilateral trade. Eitan Kuperstoch, Israel's commercial attaché to Tokyo, noted that despite the figures, "over the past year, the Japanese business sector’s interest in Israel and in cooperation with Israeli businesses has grown, in particular in the homeland security sector, including cyber-security." “In the past year alone, more than 6,000 Japanese businesspeople participated in events organized by the commercial attachés of the Israeli Ministry of Economy," added Kuperstoch, who commented that there is growing interest among Japanese financial institutions in Israel. Kuperstoch further noted that in recent months three Japanese business delegations, most notably the highly influential Keidanren Japan Business Federation, have visited Israel, in a sign of growing Japanese desire to engage Israel in trade. The new agreement will be managed by the Office of the Chief Scientist in the Economics Ministry. Avi Hasson, Israel's Chief Scientist who heads that office, added his praise of the new agreement. "At a time when the largest Japanese companies are searching for new engines of growth via business and technological innovation, this is an excellent window of opportunity for Israeli companies in general, and specifically for those with groundbreaking technology," commented Hasson. 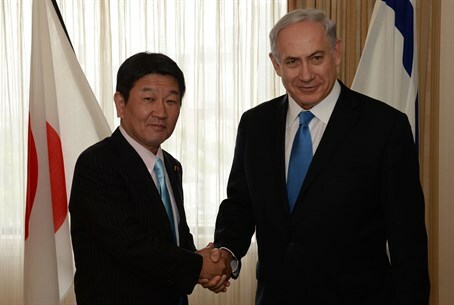 Minister Motegi's visit comes upon the invitation of Prime Minister Binyamin Netanyahu, who visited Japan in May to encourage bilateral cooperation. While there, Netanyahu highlighted the mutual benefits of such cooperation, saying "Israel is a world center of cybersecurity, and we're seeking to cooperate...with other countries and certainly with Japan." Netanyahu was joined in his visit by Eugene Kandel, Chairman of the National Economic Council, who said "the presence and cooperation of Japanese corporations are lacking in Israel. In various industrial fields, there are numerous Israeli corporations that can become partners of Japan."